Education is central to changing attitudes and behaviours and fostering long-term commitment to conservation. In China, local bird monitoring groups are engaging school children in order to secure the future of some of Asia’s most threatened bird species—Blue-crowned Laughingthrush Garrulax courtoisi and Chinese Crested Tern Sterna bernsteini. The entire world population of the Critically Endangered Blue-crowned Laughingthrush Garrulax courtoisi is confined to a handful of sites in Wuyuan, Jiangxi Province, China. Education work to raise public awareness of the conservation status of this species is critical. Consequently, bird monitoring groups—supported by BirdLife partner the Hong kong Birdwatching Society (HKBWS)—have been established at schools near to Laughingthrush breeding sites. In total, six schools are involved—Tai Bai Town Center Primary School, Yutan Primary School, Caomen Primary School and Qiukou Secondary School are in remote villages, and Tian You Secondary School and Ziyang Secondary School are in Wuyuan city. Bird monitoring groups were established in the schools in 2009, and these groups helped to run birdwatching talks in each school in October 2010. More than 300 students attended the talks, which also helped school science teachers to improve and enrich their school courses, with more emphasis on bird conservation and local biodiversity. After the birdwatching talks, many more students became interested in joining the bird monitoring groups and taking part in the weekly bird monitoring around their schools. Students were shown how to observe birds and make scientific records of bird behaviour. They were also encouraged to communicate with their group-mates and their families about their bird sightings. A booklet about the common birds of Wuyuan, which includes photos of 100 bird species by local photographers, has been produced, and 4000 copies printed. 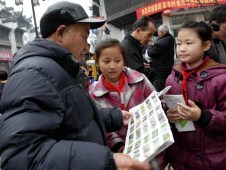 At an awareness-raising event in Wuyuan city, members of the bird monitoring groups introduced birds and birdwatching to the wider public and distributed the booklet. As a result of the project, the Department of Forestry will now work together with the Department of Education on more local school conservation programmes. School teachers are enthusiastic and willing to keep running birdwatching activities in the future. With a population of less than 50 birds, the Critically Endangered Chinese Crested Tern Sterna bernsteini is on the brink of extinction. The greatest threat to its survival is egg collection by fishermen for food. An activity that continues even though the species’ only known breeding sites on the Mazu and Jiushan Islands, off the coasts of Fujian and Zhejiang Provinces respectively, are both within protected areas. With support from the BirdLife/Hong Kong Bird Watching Society China Programme, a grant was secured from the Hong Kong Ocean Park Conservation Foundation, which has enabled the Fujian Bird Watching Society to continue its surveys of Chinese Crested Tern and to try to locate undiscovered breeding colonies. The project also conducts education and awareness work in schools and local communities around the known tern sites, and raised awareness of the need for strengthened law enforcement and other actions among local government and other stakeholders in Fujian and Zhejiang Provinces.